Balloon Panic is a minigame found in Mario Power Tennis. The goal is to stop Klaptraps from popping any DK balloons. If a Klaptrap is hit three times, it will fall off, and the player will gain one point. There are three Klaptrap colors: green, red and blue. Green ones are slow, red ones are fast and blue ones are very fast. They all follow an electric current of the same color. To change it, one must hit a vine panel to divert a Klaptrap to an empty space. 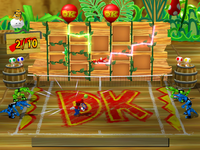 The special game is played on DK Jungle Court. Super Panic - Normal - Protect three blue balloons from 20 Klaptraps. Balloon Panic Challenge - BONUS - Protect four green balloons from a horde of Klaptraps. This page was last edited on March 16, 2018, at 20:44.